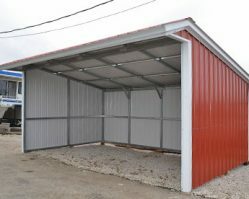 All Steel Carports is truly a build-to-suit manufacturer. Our wide range of styles and options mean we have the product for you, regardless of the application. Any width, any depth, our buildings will provide top-of-the-line protection for all your important equipment. Whether you are protecting a picnic, car, shop, semi, tractors, or livestock, we can provide the best protection at the lowest price. Check out our awnings, lean-to’s, and combination buildings. Let us work with you to build the structure that you need!